Think of the holidays as an opportunity to shape your family culture. Each family gets to decide what matters to them, what traditions reflect their values, what ways of spending time together they want to embed in the grain of their family memories. The things you do year after year will stand out, especially if you give them significance by your intention. If, like Jodi and Tim, you wonder how to take your lofty ideals and make them into practical choices that can actually fit into your life... well, I say start with something small and achievable. Starting is the most important thing, and bit by bit you build it. For Brandon and I, it started with the choice to buy a live Christmas tree. And if we were going to spend the money on one each year, we wanted to enjoy it for a long while, so we decided to always buy our tree the day after Thanksgiving. When our first child arrived, we attached taking a photograph of the children among the evergreens to the tree-shopping outing. I love those pictures taken the same day every year! Then several years along the way, we found a local farm that grows the trees and makes the process a little more fun by offering free hot chocolate and a hay ride. Oh, how special is a hay ride! It's the little things, but all bundled together we now have a family-tree tradition that our preteens still adore and were eager to share with baby Rora. Our traditions aren't fancy or expensive and they're also not hard for this mama to deliver. We don't bake cookies for all of our neighbors and package them in DIY-decorated tins with bows and kind letters. That would be a lovely gesture! But, I like to keep it a bit simpler. Better to set a comfortable "standard" so to speak, and go over-and-above some years! On Christmas Eve we make cookies with Grandma, sometimes lots of different kinds and sometimes just the cookie-cutter sugar cookies the kids love most. And then we share. 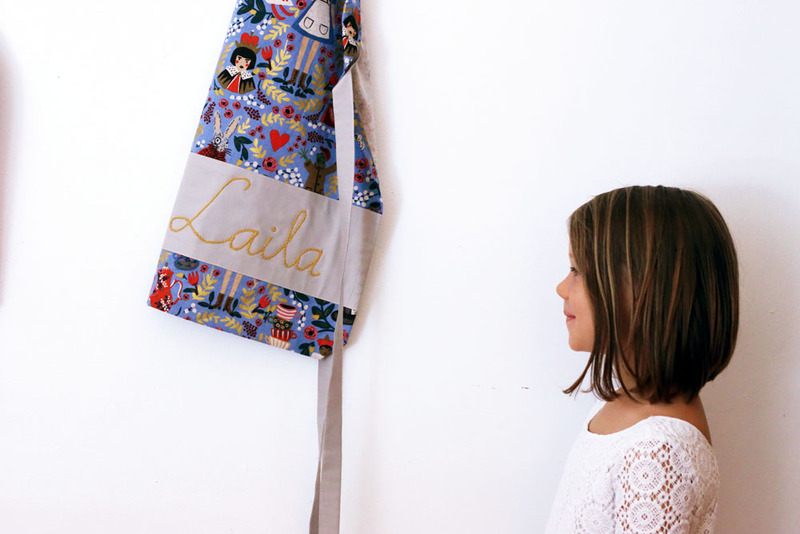 I developed an adjustable child's apron for Stitched Holiday. It's designed to fit from little to big so your child can wear it year after year, adding a soft, personal element to your holiday baking traditions. Quickly and easily inscribe each one with the child's name. With this little bit of effort you mark that time spent together as treasured. Your traditions will be unique to you, just as ours are unique to us. Since you are a maker, it's only natural for the works of your hands to become woven into those family memories. In Stitched Holiday you can take advantage of streamlined projects designed to bring you from start to finish so you can start celebrating with your creations this year. Have you considered marking the days until your holiday with a countdown calendar? Instead of buying something disposable each year, wouldn't you love to make one all your own? And what you do with it is up to you. You can just mark the days by moving the gingerbread man along the pockets, or get more involved with little candies in the pockets or notes with fun things you'll do on certain days. Stitched Holiday includes a downloadable with ideas for your countdown pockets and another downloadable with our famous sugar cookie and icing recipe (they're stackable when the icing dries!). We do make them from scratch, and they are the best darn sugar cookies I've tasted. I'm with Jodi's parents - don't let the holidays be stressful! But, avoiding stress doesn't have to mean doing nothing special. It means making sure your choices are intentional. Oftentimes, it just means deciding to do something you want to do anyways and something nice in the same way each year, so that it gains extra meaning and becomes part of your family culture. It is my hope that the Stitched Holiday projects assist in some small way by providing personal, made-with-love touchstones for your cherished traditions. If you haven't already done so, you can sign up to receive notice when Stitched Holiday opens for registration later this September. The course runs live seven weeks, October 1st through November 18th. You'll have forever access to the materials though, so you can add to your handmade holiday collection as the years go by. More details to come!